The Sheraton Anchorage Hotel & Spa enjoys a fantastic location just minutes from downtown Anchorage whilst still giving you the opportunity to enjoy the wilderness of Alaska. The hotel is located close to the best restaurants, museums and tourist attractions so you have everything you need within easy reach. The staff at the Sheraton Anchorage Hotel & Spa is on hand to ensure you have a fantastic stay and the accommodation on offer gives you all the amenities you could need in a comfortable and spacious setting. The hotel has 370 guest rooms which all include room service, 42" flat screen TV, refrigerator and high speed internet. The rooms are spacious and include a desk and free local calls as well as the option to enjoy in-room dining. Guests at the Sheraton Anchorage Hotel & Spa can utilise the complimentary 24 hour fitness centre or try a treatment at the Ice Spa and the hotel has barber services and a luggage storage area should you need it. The Traditional Rooms offer a smoke-free comfortable space to relax and you get to enjoy spectacular views of Anchorage, Cook Inlet or the mountains. The Sheraton Club Room sleeps 4 and has simply breath-taking views of the surroundings and with this room option you get exclusive access to the Club Lounge as well as complimentary breakfast and hor d'oeuvres. 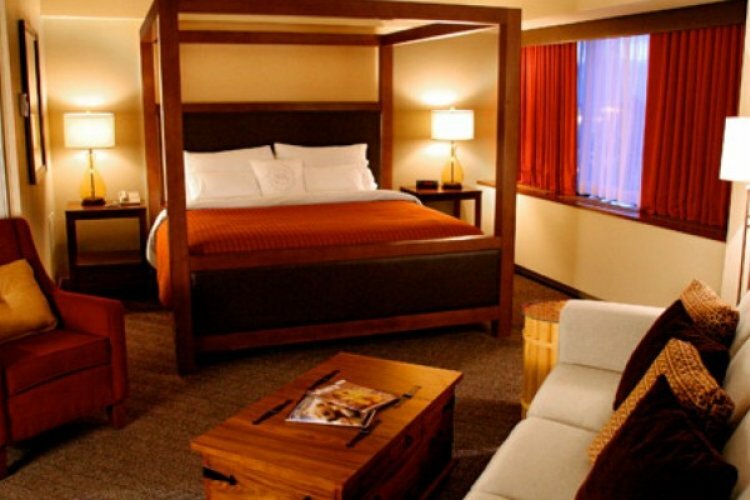 Those looking for plenty of room can choose a Junior Suite at the Sheraton Anchorage Hotel & Spa, where 430 square feet of space with plush furnishings is the perfect place to relax after exploring the sights. The suite includes a large seating area with a sofa and coffee table and these rooms are designed to make the most of the beautiful views. The hotel has many amenities to make sure you have plenty to do during your stay and these include the Sheraton Core Performance Fitness Centre, 24 hour front desk and golf and tennis nearby. The Ice Spa provides an excellent experience for relaxation and tranquillity and you can enjoy a massage, facial, body treatments or a manicure whilst taking in the views of the Cook Inlet and Cugach Mountain range. The restaurant options at the Sheraton Anchorage Hotel & Spa ensure there is something to suit everyone whatever your appetite or desire. The Jade Restaurant provides a casual ambience where you can enjoy fantastic steak and seafood dishes as well as a breakfast buffet or light lunch. Located in the lobby is the Ptarmigan Lounge where you can enjoy dinner with friends or sip a warm drink by the fireside. The Ptarmigan Lounge also has a number of tasty dishes to choose from on the bar menu which includes a number of refreshing cocktails and local beers. Experience the rugged wilderness of Alaska whilst enjoying luxury, comfort and the proximity to downtown Anchorage makes this hotel a great starting point for exploring the local sights. "Better than expected for the time of year"
"generally sunny with above average temperatures." "A little cloudy and windy but overall quite good." "Some drizzle and cold days on the water but generally good with some sunshine"